A site offering in depth analysis of Lebanon's politics, with a focus on elections. I am a senior analyst and university lecturer, with a keen interest in Elections and electoral reforms. The last word on Tripoli: It’s a turnout game! PM Saad Hariri’s Future Movement (FM), former PM Najeeb Mikati’s Azem Movement, Safadi, and even General Rifi have joined a grand alliance and are supporting MP Dima Jamali, whose election was nulled by the constitutional Council. Meanwhile, the contender, Mr. Taha Naji and his list headed by Mr. Faisal Karameh who filed the motion against MP Jamali’s election, has refused to participate, claiming that he should have won the seat by default once MP Jamali’s election was deemed irregular. 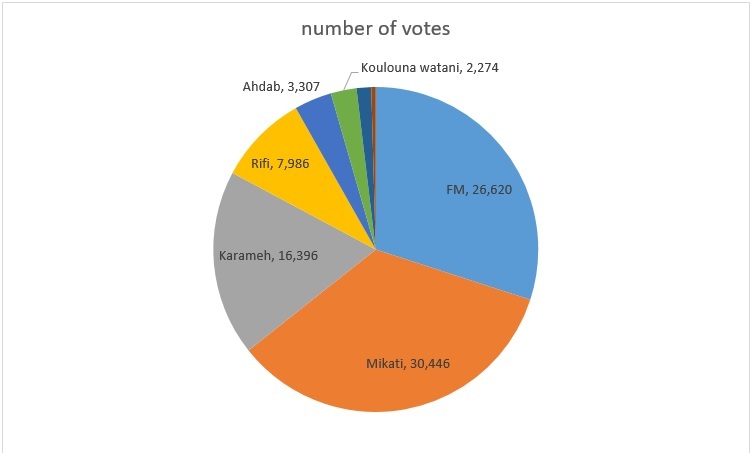 Mathematically, the current alliance between Future Movement, Mikati, Rifi should receive 65,000 votes based on the 2018 elections. Meanwhile, the main contender Mr. Mosbah Ahdab should get around 3,000. These numbers are misleading because the turnout this Sunday will be much, much lower than in 2018. Indeed, in the 2018 general elections 94,047 voted in Tripoli, out of 237,330. This amounts to a 39.6% turnout rate. I project that at best, around 50,000 voters will participate this Sunday, and probably less. This is equal to a 20% turnout, plus or minus. 1- turnout has been historically lower in special and by elections in Lebanon. The only available data point is a comparison between 2009 general elections and 2010 special elections in the Minieh Dinnieh district. In 2009, the 14 March candidates won with an average of 38,000 votes. Meanwhile in the 2010 by elections 14 March candidate won with around 20,000 votes. That is almost a 50% drop in turnout. (unfortunately, due to the lack of open data, additional data points, electoral statistics and numbers are hard to come by, especially electronically and in a machine-readable format. This is why we have worked on the Data Liberation Project with NDI. 2- usually, when a political party is not directly involved in the elections, its effort to energize the supporters and push people to vote is much lower compared to when it has a candidate running. Thus, Mikati, Safadi, and Rifi will not fully deploy their electoral campaigns or spend the necessary funds and efforts to increase turnout and enthusiasm among their supporters. 3- In general, voters are much less likely to participate in low competition elections with no strong candidates running against each other’s. Therefore, if we apply a 20% general turnout to the alliance of Future Movement, Mikati, Rifi Mrs. Dima Jamali should receive 32,000 votes. I still believe that this is still a high number, and hard to get. On the other side, we have Mr. Mohsbah Ahdab, an ex-MP that was a major component of 14 March coalition, in addition to several civil society candidates. Mr. Ahdab received 3,300 in 2018, anything above that will constitute a good showing. Especially if he reaches 5,000 (10,000 is even possible, but hard, if Karameh and other dissatisfied parties rally around him). Meanwhile, the civil society candidates, seems not to have learned anything from 2018. They fielded five candidates, diluting their support, and depressing the enthusiasm of anti-establishment voters. They are not expected to receive more than a few hundred votes. In conclusion, Future Movement candidate is almost assured of victory, however this election will be a test for FM ability to energize and push their supporter to vote, and will show if Mikati, Safadi, and Rifi’s support was real or just words. The threshold will be around 20,000 votes for Jamali, any result below would be disappointing. Meanwhile, anything above 25,000 would constitute a great showing and a renewed vote of confidence for Future Movement and PM Hariri popularity in Tripoli. PS: watch turnout during the day, and compare it to this partial turnout list, courtesy my obsession with archiving election data. Although, these numbers were posted by the Minister of Interior during election day on May 6, 2018. But the numbers are not very accurate, use them more as an indicative trend line, rather than in absolute terms. Posted on April 12, 2019 April 12, 2019 Categories Analysis, DLPLeave a comment on The last word on Tripoli: It’s a turnout game! In a surprising development, nine months after May 2018 parliamentary elections, the Constitutional Council decided to annul one of the results of the North 2 district, removing MP Dima Jamali (one of only six female MPs in Lebanon) from office, and calling for new elections! The elections should be held within two months, on majoritarian basis, in the Tripoli sub district! They say timing is everything! Indeed had this decision made public two weeks ago, just before the formation of the government, it would have definitely upended the whole process and the government would not have been formed. At this time, the effects of this decision are minimized, the political balance has been set, and the government has been formed, and won an overwhelming vote of confidence. However, such a decision could be used by anyone who want to further challenge the power base of the prime minister. Turnout: turnout was fairly low in Tripoli, with only 30% significantly less than the national average of 49%. Turnout will be critical in this upcoming election. People are generally less motivated and enthusiastic in run off elections, and it will surely be lower than the 30%. If any party could build momentum and conserve a good showing, surprises might be in store! Future Movement and Mikati are the clear favorites! The rest are divided among several opposing forces, with Karameh at 16,396 almost half of Mikati. Ashraf Rifi, who won the 2016 municipal elections come at a very distant fourth with almost eight thousands.The rest of the political factions can barely muster another 8,000. Thus it will be a game of alliances, with Mikati playing the role of king maker, whoever he sides with ( either FM or Karameh) would win.However, a Mikati FM alliance seems more plausible, as the two are already allied in the government and politically close. On paper, such an alliance should give their candidate a large majority of almost 57,000 votes. It is important to note that this will be an open election, so if Mikati decides to put forth his own candidate, all bets will be off and the smaller parties role and importance will exponentially grow ! Nevertheless, this scenario seems far fetched, and Mikati would probably choose to stick with PM Hariri and Future Movement. Finally, a word to the wise, in 2016 municipal elections a large Mikati and FM alliance was formed, yet Ashraf Rifi was able to win the election. Thus, it is imperative for these political parties to energize their base, and run an efficient and smart electoral campaign! Especially if this turns into a three way fight! Assuming of course that the Council’s decision is respected and the elections are held on time! Posted on February 21, 2019 February 21, 2019 Categories Analysis, DLP1 Comment on A late winter surprise! Usually US mid term elections are a routine affair, where the people cast a vote supporting or censoring the current president and his policies. This year the elections are crucial, to the US, and dare I say, to the world. Trump won the presidency riding a wave of authoritarian popularism, that spread to Eastern Europe and reached Brazil. Using xenophobia, latent racism, and the economy changing from an industrial focus to a modern digital and open one, these autocrats have reached power and started dismantling the Democratic Institutions that allowed them in. In a few hours we will see, it all rests on turnout, on the willgness of young people and minorities to vote, en mass! Posted on November 6, 2018 November 6, 2018 Categories opinionTags midterm, opinion, USLeave a comment on The US Midterm Elections! A few days after the May 6, 2018 parliamentary, the Ministry of Interior (MOI) published the results. The initial results were in a PDF format, with limited information. They lacked a breakdown of participation or voting per district. As an avid analyst with an interest in data and patterns recognition, that was very frustrating. Fortunately, the MOI released the full results a week later. However, the MOI also published these results in a static PDF format, grouped by the preliminary counting committees, severely limiting any possible analysis and cross linkage. Consequently, I started working on possible methods to convert and reorganize the data to make it easily accessible, and then cross linking it to gender and sect, to allow a deeper and richer analysis. So I took my home district Saida as a case study and went to work. Adding the Sect and gender labels of each ballot bureau, by using the MOI data base. It took me two weeks to finalize the Saida district (one of the smallest in Lebanon), allowing me to use the newly organized data to write a deep analysis of the district’s results, learning about the turnout and voting patterns by gender and sect. Moreover, the data opened up another level of analysis, such as the linkage between women turnout and voting, and the presence of strong women candidates. However, the amount of time and efforts the first case study took, convinced me that this should be a larger team effort. I contacted several institutions to propose possible cooperation. The National Democratic Institute (NDI) expressed interest and they offered to support the project, and this is how the Data Liberation Project (DLP) started. After the initial proposal was accepted, I hired several young and enthusiastic experts, organized the workflow, planned the different phases, and prepared the tasks. The Project was launched and we slowly started the conversion and the reorganization of the elections results. Two months later, the data was finalized, and after a long and assiduous editing and corroborating effort, we submitted the finished project, to the satisfaction of NDI and team. Consequently, it is my honor and privilege to freely offer the full results of the Lebanese 2018 parliamentary elections, cross checked with gender and sects, for the general public, students, and experts. Finally, I would like to thank the whole NDI team, for their unwavering support, professionalism, and help in completing such an important project, that aim to provide free and open data, considering how hard it is to get unbiased, objective, and solid data in Lebanon. It goes without saying that the project would not have been possible without the young men and women who worked tirelessly for its success, especially Fouad Saoudi and Lana Skaffi, among many others. A detailed analysis of SAIDA’s 2018 electoral result! Rafik Hariri’s legacy can be traced back to this once small city, on the Mediterranean, with its plentiful orange orchards and long history. He was born there, and his siblings and distant family are still living in the city. Rafik Hariri helped rebuild and renovated Saida’s infrastructure after the 1982 Israeli invasion, building roads, school, and various projects. Thus, the two Sunni MPs of the city have always had a symbolic importance. In 2009, for the first time since the formation of the Future Movement (FM) party, it was able to win both seats. Unfortunately, in 2018 FM failed to repeat this feat and their old adversary Oussam Saad took the second seat in the place of PM Fouad Sinioura. It is worthy to note that in 2009 Mrs. Hariri won with 25,500 votes to Oussam Saad’s 13,500. Indeed, MP Hariri received almost 64% of the total vote, with a record setting 68% participation, the highest in Lebanon. In 2018 Future Movement numbers fell in Saida to 15,308 against 10,255 for Oussam’s, with only a 54% participation! So what happened? In this deep analysis of the results, I will try to find patterns in the numbers, and draw some conclusions. I will tackle this in two sections: turnout and voting patterns! This analysis has been made possible with the help of NDI, with whom i have been working on a data liberation project, to transform the Ministry of Interior official detailed PDF results into machine readable excel, and add sect and gender information. To learn more about this project please use this link. Even more significant, there are more female than male voters in Lebanon. Almost 53% (according to UNDP). Additionally, in relative numbers, women turnout is higher than men’s, yet in Saida, Sunni women turnout was lower than men, at odds with Shia and Christian women! Women turnout, as previously mentioned, was lower than men’s. Even though the head of FM list in the district was a women, but that did not raise the turnout. This are very important data points, and once the rest of the districts are analyzed, it will be possible to draw correlation between several variables. For example is women turnout affected by the presence of strong women candidates, and do women vote more for women candidates? I believe that Saida’s voting patterns might hold true for most of the other districts, and i will try to show that in future analysis. Indeed, Shia voters voted in mass and with a very high adherence to party instructions. Meanwhile Sunni voters were lethargic, and their vote was split and dispersed among many lists (see Beirut II as a perfect example), severely lowering its effectiveness. On the other hand, the Christian voters were more fired up, and more disciplined, but divided into different parties (FPM, LF, …) this sometimes played against them, in Jezzine for example. Thus in Saida, Sunni turnout fell heavily, and from a 64% support to FM in 2009, to just 46% in 2018. On the other hand, shiaa voters in Saida adhered strongly to their party’s instruction and voted, cross confessionally, to their sunni ally at a very high 73% rate. This trend of shia voters, is especially salient in the Southern and Baalbek districts reaching high 80 or even 90% adherence. In Jezzine too this was even more evident, shia voted at a dizzying 92% for their Christian ally Azzar. Lastly, preparation, training, and information, pay and pay very well. Saida suffered of one of the highest rates of invalidated ballots, at 3.14%. Meanwhile, in Jezzine it was half of that, at 1.55%. With the Ministry of Interior being busy with the overall organization of the election, it fell to the parties and NGOs to train their people and their supporters on how to vote and how to help voters during the process. Thus, certain parties (Lebanese Forces come to mind) were able to prepare their electoral machine, train their people and observers, inform their electors, and they reaped the benefits, by doubling the number of their MPs. For example, their regions of Bcharreh had the lowest rate of invalid ballots at 1.71%. Others did not, and the invalid ballots rate in their strongholds was fairly high, robbing them of precious seats. For more analysis on the invalid ballots and turnout, check this link. Finally, it is worthy to note that despite rampant sectarianism and the ugly inflammatory rhetoric that preceded the elections, there was small but significant cross-sectarian voting. 12% of Saida’s shia voted forMrs. Bahiaa Hariri and 34% of Christians, and she received 1,100 Christian votes for Jezzine. I firmly believe that political parties, focusing on issues politics (waste management’s, electricity, and environment) with a clear and organized agenda can make significant headway in the Lebanese political arena. This leads us to the a very important question on why the civil society wave started in 2016 with Beirut Madinati receiving more than 35% of the vote in Beirut’s municipal elections, did not make a significant breakthrough in the parliamentary elections, winning only one seat. A question that I will deal with in depth in the next several articles. Posted on July 6, 2018 July 7, 2018 Categories Analysis1 Comment on A detailed analysis of SAIDA’s 2018 electoral result! Unfortunately, as i mentioned in my analysis of the turnout numbers, there are two mistakes that i was able to catch in the official numbers. it concerns Zahleh’s fifth counting committee, where a ballot box usually holding 600 registered persons plus or minus (as inferred by most ballot boxes in this sub-committee) had 315,617 as the number of registered. so to solve this issue i assumed that it was 617. The second is similar to the first, but in Tripoli. Here too, a ballot that was supposed to hold in 600’s was put in for 62,581. again i corrected it as 625. A first look at the numbers! The turnout number of the 2018 election is 48.02% (1,861,203 voted out of 3,875,981) There is a 5.35 % drop in Turnout between 2018 and the 2009 elections. Most of the districts saw a drop. The only district that showed an improvement in turnout was the Bekaa III (Baalbeck – Hermel), with an impressive 9.44% improvement. Meanwhile, another four direct held almost the same turnout between 2009 and 2018 Mount Lebanon IV (Chouf Aley) with -0.38 , South III with +0.38, Beirut (as the districting of Beirut changed between the elections, I had to make a combined turnout for both Beirut I and II) with +0.61%, and Mount Lebanon I (Jebeil Kesrouan) with -1.16. Concerning, the blank and invalid ballots percentages, there was a similar trend for the blank ballots with 0.81% in 2018 compared to 0.68% in 2009. It is worthy to note that in three districts the blank ballots rose above the average reaching more than 1%, in South I (Saida and Jezzine), South II (Tyre – Zahrani), and North II (Tripoli, Minyeh, Dinnieh). In South II, the rate is understandable as there was only two competing lists, and many felt that neither represented them. So is the South I rate, where the field was highly politicized, but with no civil society list presents. However, for North II, it is a point that I will tackle after talking about the invalid votes. As expected, there was a large increase in invalid ballots, due to the introduction of a new proportional electoral system. The rate of invalid ballots jumped almost 300% from 0.61% in 2009 to 2.09% in 2018!! 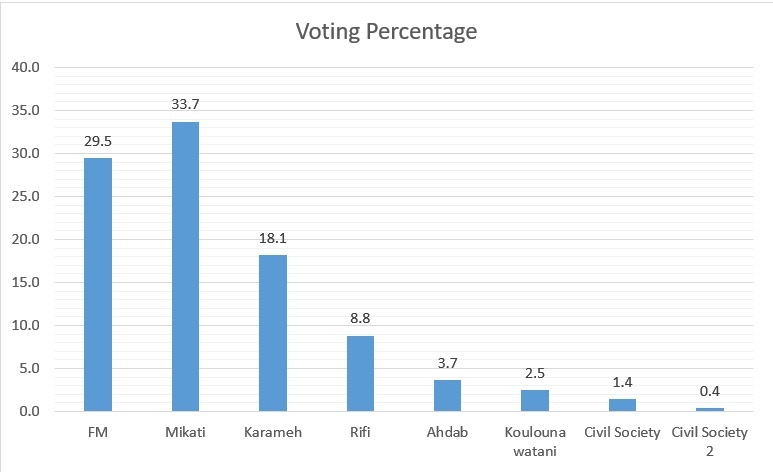 In a district by district comparison the higher trend was similar in most, with the exception of the North II (Tripoli, Minyeh, Dinnieh) district that had 3.52% of invalid ballots, a full percentage point above all other districts!! Both in blank and invalid ballots North II district is above average, in a statistically significant way. It would be interesting to keep an eye on this district, with all the judicial procedures being made. This district, has a history of having slightly above average Blank and invalid ballots, but that alone does not explain these big numbers. Indeed, in 2009 Tripoli was at 1.15% for invalid compared to a national average of 0.61%, and 1.14% in blank ballots for an average of 0.68%. However, it was not the district with the highest number, and was fairly in line the overall curve. *All conclusions and numbers in this analysis are based on the detailed results published by the Ministry of Interior on this website. If anyone is interested by the excel sheet with all the numbers extracted from the official PDF documents, you can find it here. Posted on May 11, 2018 May 12, 2018 Categories AnalysisTags Analysis, elections, results3 Comments on A first look at the numbers!